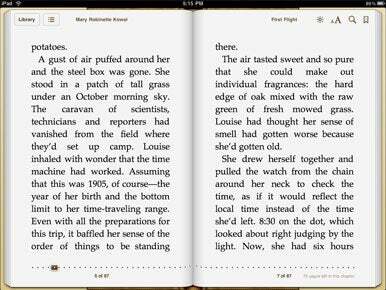 iPad owners have been able to read e-books with Apple’s iBooks app since that device launched in early April. The iPhone-compatible version only become available recently, with the arrival of iOS 4. Both versions of this now-universal app perform quite capably as competitors to the other big e-readers on the market—Amazon’s Kindle app and Barnes & Noble’s BN eReader. Now that iBooks is available on multiple platforms, it’s only fitting that the app follows in Amazon’s footsteps, with books re-downloadable at no extra charge on all of your iPhones, iPod touches, and iPads. Like apps (and unlike songs), it’s a “buy once, download repeatedly” proposition. The iBookstore includes a Purchases tab where you can find all the books you’ve ever bought if you want to read them again, or download them to another device. And since iBooks wirelessly keeps track of where you are in your book, you can read a few pages on your iPhone, and your iPad will automatically put you on the right page when you resume reading there. It’s important to note, though, that browsing the iBookstore is a mixed bag, for several reasons: First, on the iPhone, the store’s a lousy iOS citizen; even if you’ve been reading in landscape mode, the store is oddly portrait-only. (The iPad doesn’t share this problem.) Apple has also neglected to include prices on most screens as you browse the iPhone version of the iBookstore, forcing you to tap into each book to see its price. This would be less annoying if Apple let you browse the iBookstore from your Mac as well, but currently the only way to search its shelves is from an iOS device. A Real Page-Turner: Reading in landscape mode with the iPad version of iBooks splits the text across two virtual facing pages. The iBookstore’s biggest weakness, though, isn’t a technical one. The store just doesn’t have enough books. Apple’s store includes “tens of thousands” of books, while Amazon’s Kindle Bookstore sells more than 600,000. If you can find the book you want, the store is great. If you can’t—in particular, if you can’t, and Amazon has it—the store has failed you. There are other differences between the iPhone and iPad versions of iBooks, including one that’s truly maddening: The Store and Edit buttons (the former, of course, for accessing the iBookstore; the latter for quickly removing multiple books) swap positions depending on your device. Luckily, you can always quickly adjust, but it makes relying on muscle/tapping memory impossible. But assuming you can successfully find the books you’re after, both the iPhone and iPad versions of iBooks offer a very pleasant reading experience. Each allows reading in both portrait and landscape modes. On the iPhone, you get a wider column of text, while the iPad splits the text across two virtual facing pages. As it turns out, though, I’m a portrait reader: I find that the iPhone’s landscape view is too wide, and the facing pages on the iPad are a bit too narrow. On both devices, portrait mode feels just right. Buttoned-Down: You get a host of options for navigating and tweaking a book’s look in iBooks, though those controls can feel pretty cramped on an iPhone. Fortunately, you can dismiss most of them with a tap. The iPad’s orientation lock makes bedtime (and other comfily-situated) reading a breeze, and iOS 4’s software orientation lock on later-model iPhones works fine, too. If you’re using an earlier-model iPhone (including the 3G), you get no lock, which can make reading more of a challenge, since it’s easy for the accelerometer to get confused when you’re lying down. 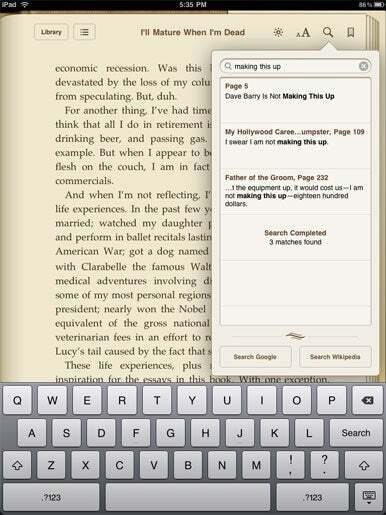 Both iPhone and iPad versions of the app offer a host of options for navigation and for tweaking the book’s look. Single-tapping anywhere on the text hides most of these interface elements; tapping again brings them back. On the iPhone, I find all the widgets—for changing the font size, adjusting brightness, searching the text, identifying your relative location in the book, and so on—distracting: it’s a lot of stuff to cram onto a single page. On the iPad, those buttons have a lot more room to breathe, and I tend to leave them visible. That’s because I’m a big fan of an iBooks feature that the Kindle and BN eReader apps (along with their corresponding hardware devices, the Kindle and the Nook) ought to implement post-haste: a small indicator telling you how many pages remain in the current chapter. E-books have many advantages over paper books, but quickly flipping ahead to see how many pages are left before you reach a good stopping point is one area where books beat e-books every time. This iBooks feature is small, but brilliant. iBooks offers great features for exploring and annotating the books you read. You can search the full text of the book for words or phrases in seconds, and jump straight to those passages. You can add bookmarks, highlight passages, and add notes—all of which are then easily discoverable from the book’s table of contents. You can tap and hold on a word or phrase to look it up in the built-in dictionary, or in Google or Wikipedia. Finding the Right Words: Type in a word or phrase, and iBooks will search the entire text of a book to find what you’re looking for. And, as you might expect, iBooks offers a slew of text customizations: You can choose from six fonts, including Georgia, which font nerds love. iBooks also lets you pick one of 11 font sizes, from comically, unreadably tiny to hilariously, unusably huge. The app also (mercifully) lets you disable full justification, although, somewhat tediously, you have to jump over to the Settings app to toggle that setting. 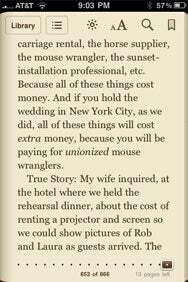 iBooks lets you read against a white background with black text, or a sepia background with dark brown text. And, of course, you can adjust the brightness—a must for nighttime reading in a dark room. Now, iBooks’s take on brightness control is decidedly different from how apps like Kindle and BN eReader handle it. Those latter two apps actually tweak the screen’s contrast (Apple doesn’t give third-party developers access to iOS’s true brightness controls), and can thus only achieve a reasonable facsimile of a black background. But they can display contrasting, lighter-shaded text atop that background. iBooks, however, genuinely darkens the screen, but darkens the text right along with it. I actually prefer the other apps’ light-on-dark approach at night and hope that Apple will add that option to iBooks in a future update. But if the company never does, the dark-on-dark is still readable; it’s just a little tougher on my eyes. The biggest test for any reading app is whether it can fade away when you want to get engrossed in a book. iBooks certainly passes that test. The page turning animations, while superfluous, feel impressively realistic. The text is quite readable, and the eyestrain I initially feared when moving from a Kindle 2 device to the iPad isn’t an issue at all. Reading on the iPhone is, unsurprisingly, a bit taxing; the small screen requires lots of page turning no matter what font-size you settle on. But it works. I did encounter a couple of bugs in my testing. Occasionally, books with fancier text layouts suffer from display issues where the tops or bottoms of characters can get cut off or split between pages. And I occasionally get greeted with a somewhat nonsensical error that the app “Failed to load book because the requested resource is missing.” Simply re-opening the book fixes that each time. iBooks also supports PDF reading. In my limited testing, the PDF handling is pretty poor: you can’t annotate or highlight PDFs, the pagination feels half-baked, and large PDFs don’t resize especially well. Fortunately, there are other apps for that. Like the Kindle app, iBooks is an excellent e-reader that feels impressively like the future—while simultaneously feeling a heck of a lot like an actual book. Right now, Amazon’s dominating selection renders it the top dog in the iOS e-reading world. But if the book you’re after is available for iBooks at a good price, the app provides an immersive and thoroughly pleasant reading experience, particularly on the iPad.